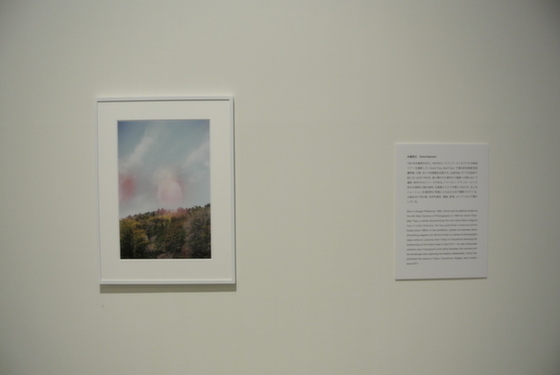 Five Japanese photographers are taking photography back to the street in the twelfth annual ‘Contemporary Japanese Photography’ exhibition at the Tokyo Metropolitan Museum. The exhibition takes on a light tone from the very start with a huge banner in the foyer of a pair of feet hovering above the pavement. 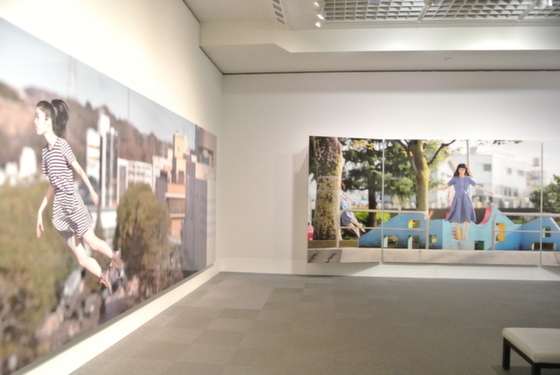 This is one of Natsumi Hayashi’s large-scale jumping self-portraits. If you’re familiar with from her online and from her blog, you’re completely thrown off by the sheer scale of her photos, leaving no question as to the distinction between these and the jumping photos your friends post on Facebook. Hayashi has been making a name for herself internationally for her series “Today’s Levitation” in which she seems to be floating effortlessly and expressionlessly in the center of each meticulously composed photograph. People often wonder to which extent these photos have been manipulated, but this is a testament to her planning and preparation – not to mention her dedication to jump from 150 to 200 times for the one image she will eventually use. 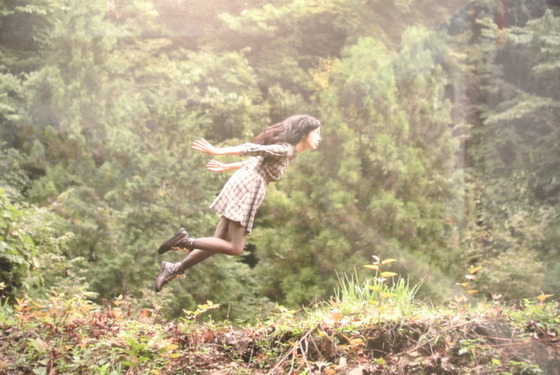 “Today’s Levitation 06/01/2012″ is a massive 8-meter long photo which was taken at the Tama Center Station building in Tokyo – a relatively ordinary station, but one that offered Hayashi an opportunity to appear to be flying after cropping out the stairs beneath her feet. She researched the location thoroughly to set up the shoot so she could jump the 200 times not only the optimal the time of the day, but also the optimal time of the year. A large pillar usually casts a shadow over this location but Hayashi discovered that the morning of the autumnal equinox (in September) is the only time in the year that this image would be possible. 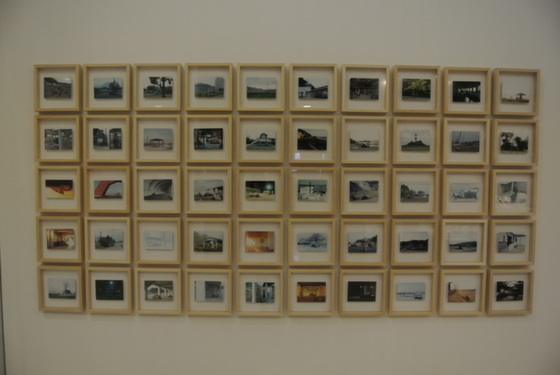 Hayashi also sometimes works backwards and accepted The Tokyo Metropolitan Museum of Photography’s invitation to make a work in the vicinity of the museum. 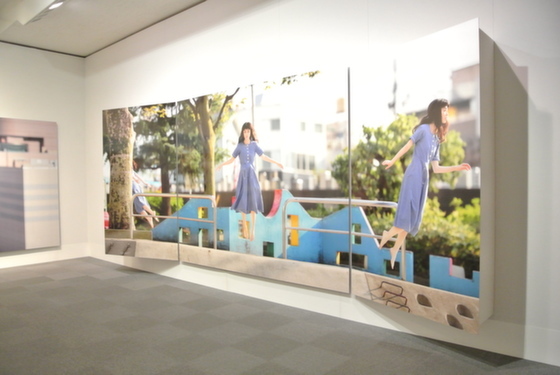 “Today’s Levitation: Ebisu Minami 2 Park” was made at a small park nearby, and is formed of a triptych of jumping photos. To preserve the consistency of the shooting conditions, she completed sets of three jumps, and repeated this 200 times. 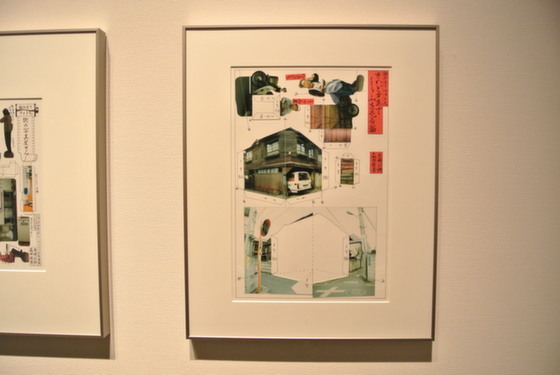 Hayashi’s works playfully question the reality that we perceive in photos, for these images are simultaneously completely authentic, time-specific and location-specific but they are also completely fabricated. 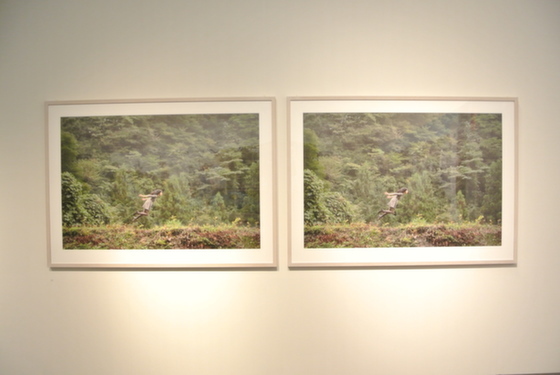 This feeling of artifice is enhanced by her 3D works – pairs of the same photo taken at the same time but from a slightly different angle. By viewing them as one, the three-dimensionality only adds to our suspicion that this photo is in fact an unaltered slice of past-reality. Despite Hayashi’s relaxed body and expressionless face, the photos radiate energy and a child-like joy, in seeing minute details at 1/500th of a second, and the elevation of a format of photography that we are all very familiar with. 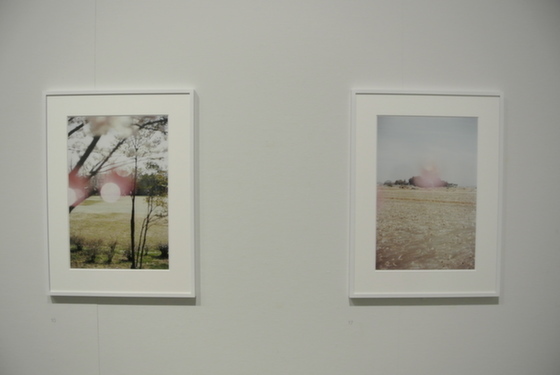 The exhibition begins with Katsumi Omori’s seemingly innocuous series of 17 portrait photos of cherry blossoms. They are composed without artifice or pretense and the colors are washed-out to give the nostalgic appearance of photos like those falling out of your parent’s early photo albums. 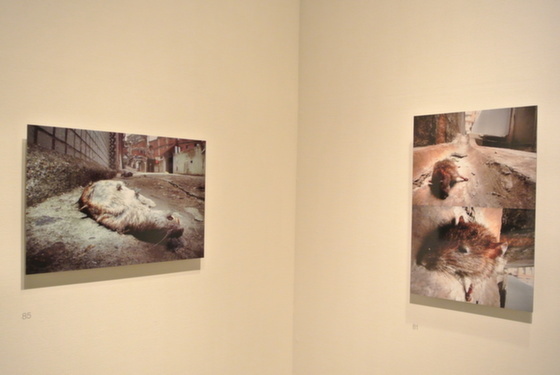 However, upon closer look, we begin to notice the emptiness and strangeness of each photo. Empty parks, cherry-blossom past its prime, people waiting at bus stops, aimless roads, rubble, and even an upturned boat. Cherry blossom viewing is an extremely popular and joyous spring pastime in Japan, and its depiction in art goes back hundreds of years, so the tone of these images are slightly troubling. 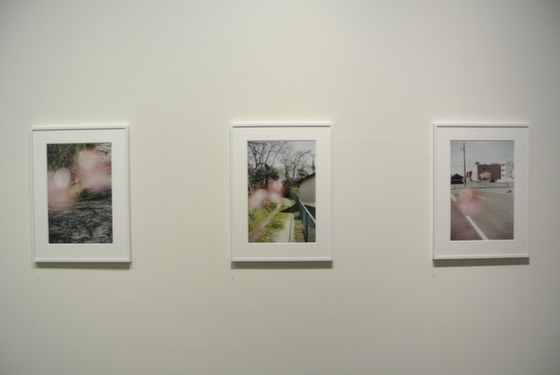 This series “Everything happens for a first time” was made in spring of 2011 as Omori’s reaction to the 3-11 earthquake and nuclear disaster. One month later he picked up his camera and followed the cherry blossoms from his house in Chiba, north to the affected areas in Fukushima to capture the scenes. These photos are also puzzling for their strange pink circles in each frame. These shapes and effects were made by “clackers”, an American toy from the 70s made from two plastic acrylic balls joined by a string which were knocked together to create the ‘clacking’ noise. These toys have since been discontinued due to safety concerns, but remain a nostalgic item for many of the older generation. While in the States in 2010, Omori happened to find these pink clackers and began using it to play with the light and he enjoyed the new perspective it offered just as he used to do as a child. This takes on a more sinister meaning at Fukushima where the pink balls of light hint at the invisible but ominous threat of radiation. All the while, the cherry blossoms bloom on. 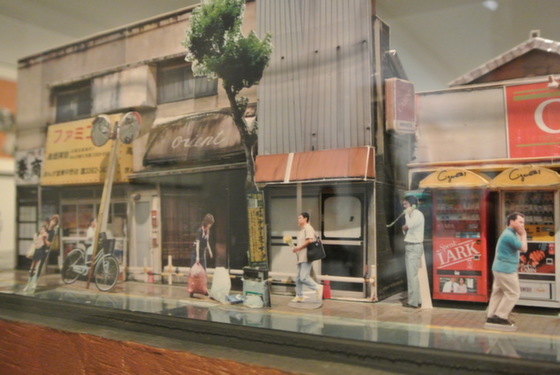 Kimio Itozaki’s impressive “A Document of Impersonal Art by Fotomo (building collection)” creates an entire street scene out of hundreds of 2-dimensional photos which really needs to be seen to be fully appreciated. 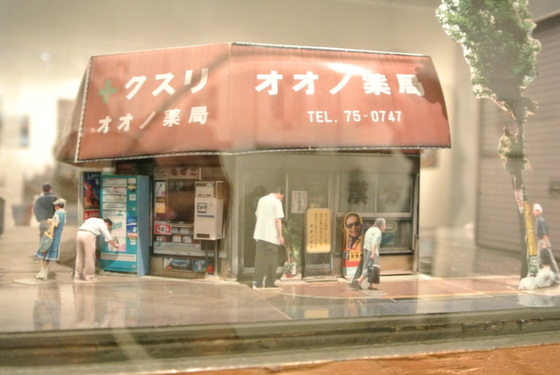 Fotomo is a technique Itozaki developed which stands for photo + model, and has a super-realist dollhouse feel to it, or that of a mid-00’s computer game. No detail is spared – he photographed and assembled not just the buildings and cars, but also the people, lampposts, pavement and rooftops. Photographing every angle of the buildings was only possible because of the bursting of the economic bubble, which led to the destruction and removal of many buildings. Indeed, we see the empty lots with weeds starting to grow through. 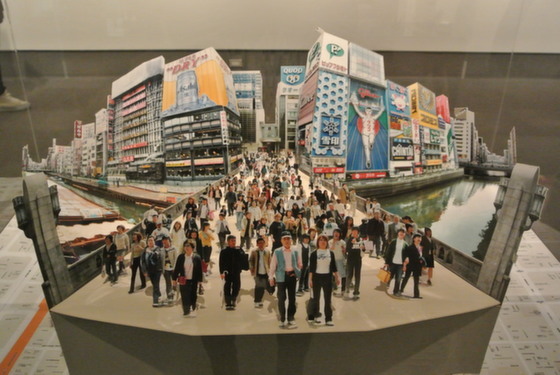 The smaller Fotomo “Ebisubashi, Osaka” takes the concept to another level, utilizing dramatic illusion of depth and perspective, and using multiple vanishing points in a scene of the most iconic place in Osaka that almost everybody in Japan has been to at least once (often on school trips). 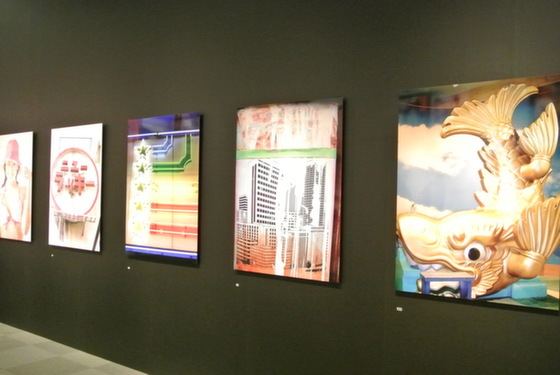 The theme of the exhibition of changing the world from the street is perhaps epitomized best by the 20 smaller fotomo originals on the walls, which are actual working fotomos that appeared in the Sampo no Tatsujin magazine from 1996-2004. The retro style and hand-drawn tabs and labels personalize the still-incomplete fotomo despite it being intended for mass-reprinting. 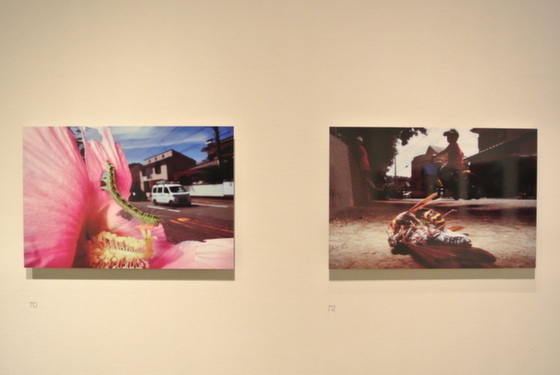 Besides these, Kimio Itozaki is represented at this exhibition by several other series, Hockney-esque photo-montages, and some series where he takes on the techniques and conventions of macro animal photography to photograph small 1/60th size figurines, insects, and even roadkill in the urban landscape. While the dead animals are morbid in their gaudy, high-focus, I can’t help but feel like they aren’t the real subject matter here. 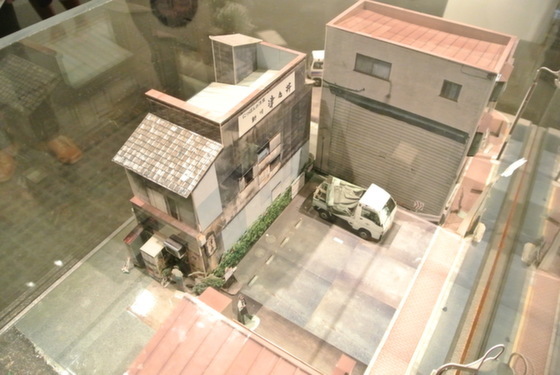 For Itozaki, the street is more than a stage for visual drama, but the subject itself. Naoki Kajitani’s JPEG series began in around 2000 when he got his first digital camera and he has hardly changed his methods or approach since – he still uses a compact digital camera without the capability of high resolution images that we all enjoy today. The 110 images stacked four high cover two walls and show all the eye-catching things from the street he has seen over the years. Individually each image gives the sense of impulse when he took the photo, and together form a tapestry of faded bright colors, fluoro-lights, rusted and peeling signboards and bare female-skin from advertisements of seedy adult entertainment venues. These are all things found all over Japan from the suburbs to the countryside towns, but we are conditioned to look away. Without identifying information as to the location or time, or the presence of actual people, these scenes could be almost anywhere. 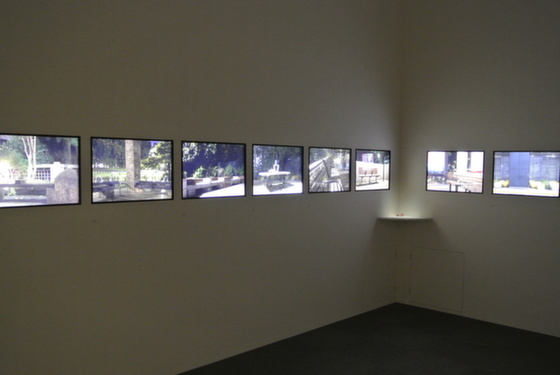 With JPEG Kajitani confronts us with this side of Japan that is not often acknowledged and the disposable nature of digital photography. 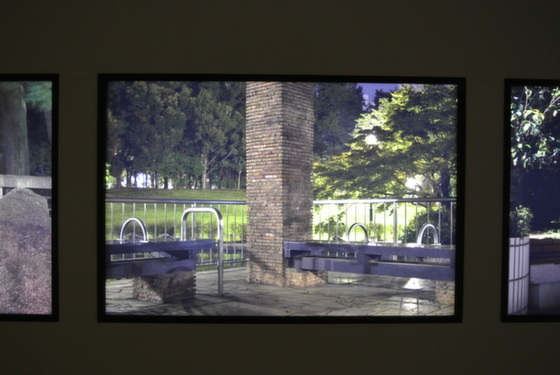 The first thing you notice in Takashi Tsuda’s exhibition space are the glowing light boxes with crystal-clear photos of empty park benches, many at nighttime. 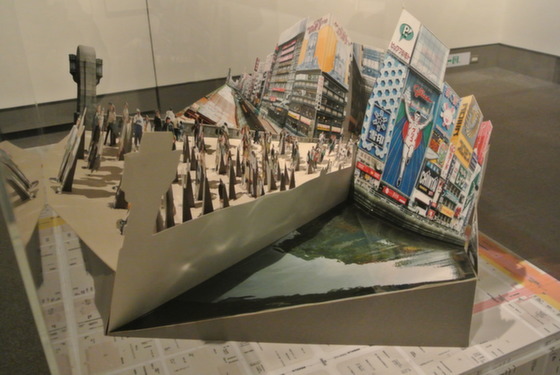 This is the series True Sleeper (objects not for sleeping on), which addresses the issues that homeless people in Japan have in finding comfortable places to sleep. The beautifully shot images with almost sculptural pieces of rubbish, fallen leaves and dramatic shadows slowly become quite cynical: none of the park benches look comfortable to lie on, as they are often designed with arm-rests that prevent you from lying down. This is driven home by a set of three photos of the well-known area in Shinjuku where the council built trash can-sized yellow and green tube-like structures for the sole purpose of preventing homeless people from sleeping there. 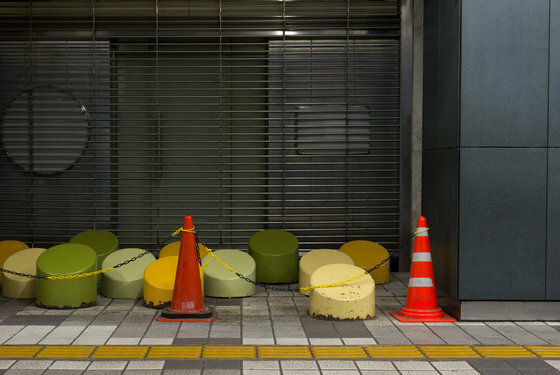 Tsuda photographed these odd shapes with the angled tops along with the construction cones and plastic chains that keep it roped-off at all times. In the series “SITE”, Tsuda tackles a similar issue of finding places to sleep the night through all over Japan. First he set up rules for an 8-month cycling and camping trip around Japan starting in Hokkaido in the winter. At every place he arrived at, he would ask the locals the same question “Could you tell me where you think I might be able to pitch a tent?” and he would set up his tent, spend the night there and document it before moving on to the next place. 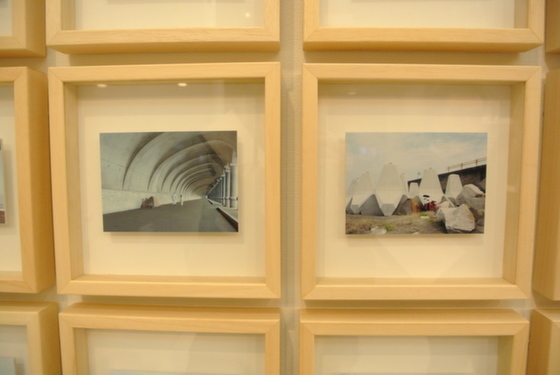 Each work is in every sense site-specific, and although we see his tent – the place he slept in for eight months – the images are somehow deeply impersonal. Sometimes his tent is next to the ocean or among huge piles of snow, but other times it is tucked under bridges, between concrete structures or simply on the street. Tsuda – and the other four photographers – are each in their own way bringing not just photography back to the street, but trying to bring people back to the street – or rather, trying to make people notice the street again, often in surprisingly different ways. In a country where millions of people commute to and from work underground and live in high-rise buildings, taking a new look at the street might really be the best way to start changing the world.